Hosting book club this month? 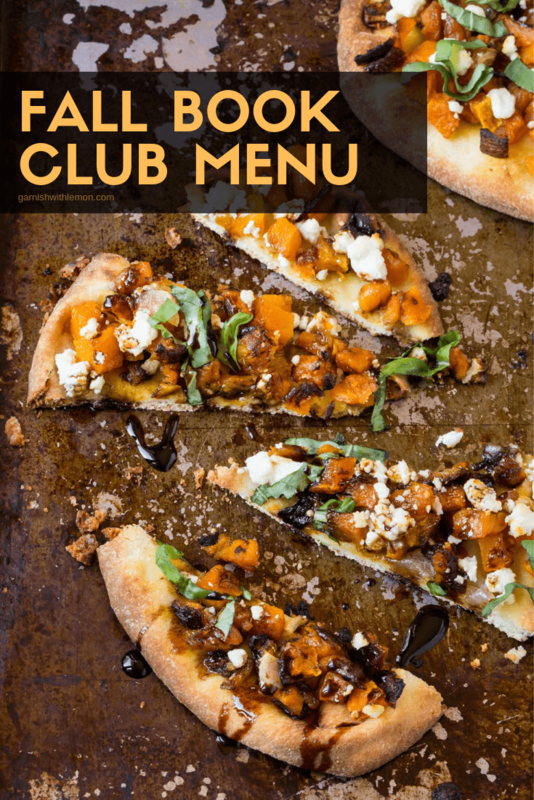 We’ve got you covered with our Fall Book Club Menu! We’re back, as promised, with our fall book club menu. Do you guys remember how this all started? Our friend, Rachel, who used to be in our book club (but has since moved away) was persistent with her requests to “Just tell me what to make when I host book club this month!”. Literally. If you need a refresher, check out our first post in the series here. So we thought why not share some of our favorite book club noshes with our readers, too? We know fall can be a crazy time of year with the holidays quickly approaching, but don’t neglect that girl time. A few hours of good food, friends and wine does wonders for the soul. And with that in mind, here are some tasty bites for your fall-themed gatherings – literary or not! 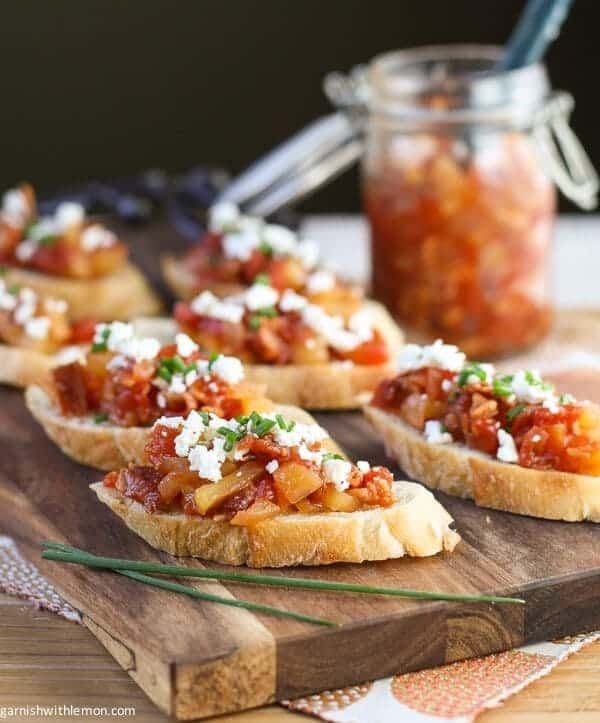 Crostini with Savory Tomato, Bacon and Apple Jam: Make the jam a few days ahead of time, so assembly is quick and easy the night of your party. The jam is also killer on grilled pork, too. Just sayin’. Creamy Porcini Soup: Chilly fall evenings call for belly-warming soup. 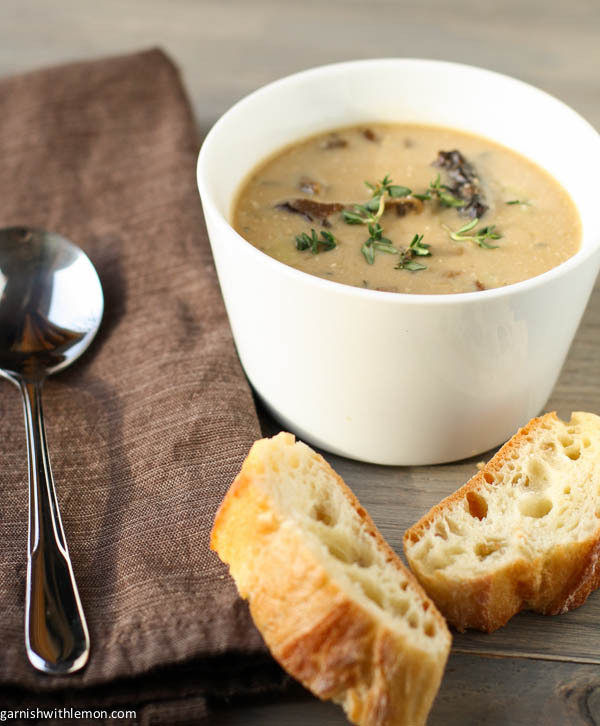 This rich mushroom soup is seasoned with thyme and garlic. Don’t forget extra crostini. 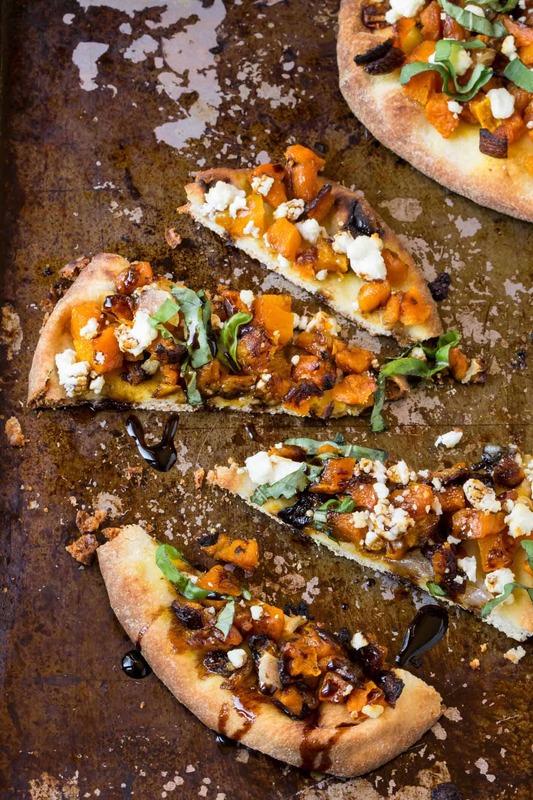 Roasted Butternut Squash Naan Pizza: Who can say no to “pizza”? It’s also a great way to use up any leftover squash you have in your fridge. 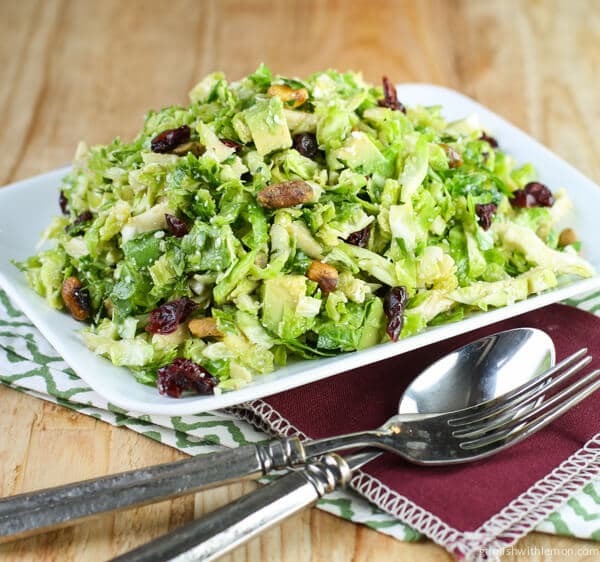 Shaved Brussels Sprouts Salad with Citrus Vinaigrette: My new favorite way to eat brussels sprouts, complete with craisins, pistachios and avocado. Gotta get those greens in before you hit the dessert platter, right? 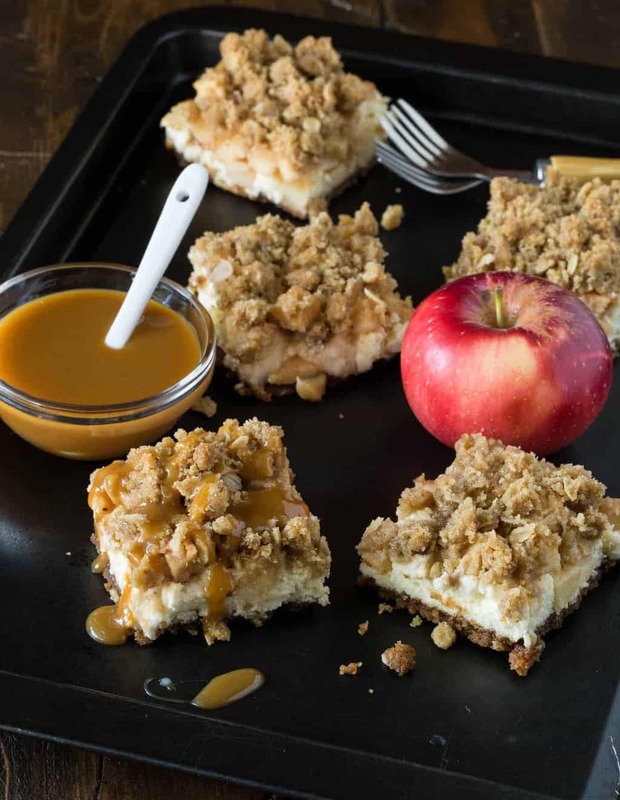 Caramel Apple Cheesecake Bars with Biscoff Cookie Crust: There is enough goodness in the title that little needs to be said about this dish. Except make it. Now. The nights are growing longer, and all I want to do is snuggle under a blanket with a good read and a glass of wine. What are you reading this month? We’re always looking for great suggestions. Send ‘em our way! Thanks for the book club bites. I belong to 3 book clubs and we need some fresh ideas. One is at 9:30 am so is a bit more challenging this early in the morning. All of your suggestions look delicious and easy to prepare. Thanks. Love Garnish With Lemon! You’re so welcome, Diane! We’re glad it’s helpful to you. Wow, 3 book clubs? That’s impressive. Please send us some of your best reads!! OH, love the menu. I’d love to use it for our Craft Sunday group. WAHOO! Thanks for sharing this. Can’t wait to try it. Sounds like a fabulous menu, I might have to start a book club. 🙂 Or just have friends over for lunch. Can we be friends, Pamela? I’d love to come to lunch! I want to join a book club too, but can’t seem to fit one in. So many are during the day. But I could be a one person book club, because I do read a lot. So I guess that qualifies me to make one more of these intriguing and delicious recipes for ‘my book club’. You are welcome at our book club, Carol. We meet at night. 🙂 Love how you’re making it work just for you! Even though it will be a new season by the time I host our book club, this is a terrific resource…and I’ll still make those apple bars. SO yummy! I am up for a book club if that includes all this delicious food! You’re welcome to join ours any time, Ami! Currently finishing “Blood on the Leaves” a book my husband co-authored with his two business partners. Very good read. Can any of these be made gluten free? What do I fix if it’s hot in the fall like we are having right now. Any ideas?